In Jordan's newest retail and leisure hub, the typical high-end boutiques, cinemas and gourmet coffee shops are tucked into an intricate ecosystem of natural heating and cooling, water recycling and hundreds of solar panels soaking up the sun's rays. 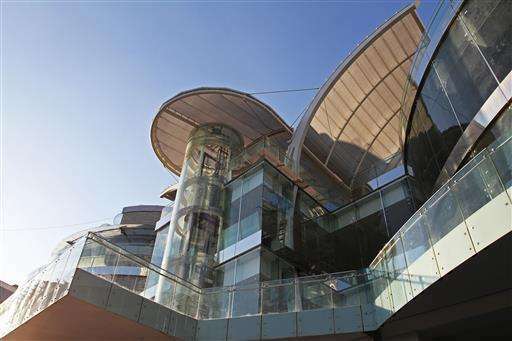 The three-story Abdali Mall is the first large-scale commercial complex in Jordan to be built to strict "green" standards. It is seen as a trailblazer in conserving what resource-poor Jordan lacks most—water and energy. It's also part of a growing movement to build with local materials. Going green is vital for Jordan, which spends up to one-fifth of its budget on importing energy and is one of the driest countries in the world. "This topic is not a luxury for us," said Ruba Al-Zubi, who heads EDAMA, Arabic for sustainability, a group that promotes environmental practices in Jordan's private sector. "For us, this is real development. If we want sustainable development, it has to be built on the standards of a green economy." 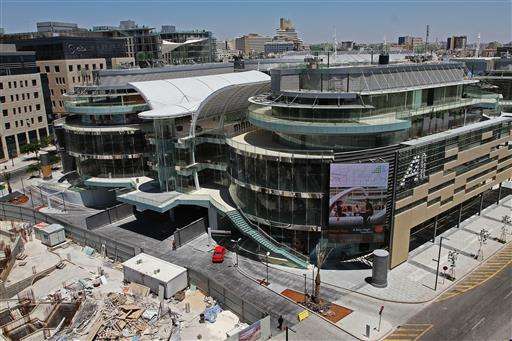 The 227,000-square-meter (2.4 million square feet) Abdali Mall is a centerpiece of a new business area in the center of the capital, Amman. The mall currently houses 25 stores, including Zara and Converse. By the time of the grand opening in October, the complex will also feature nine cinema screens, a food court, a dining plaza and a supermarket, mall management says. 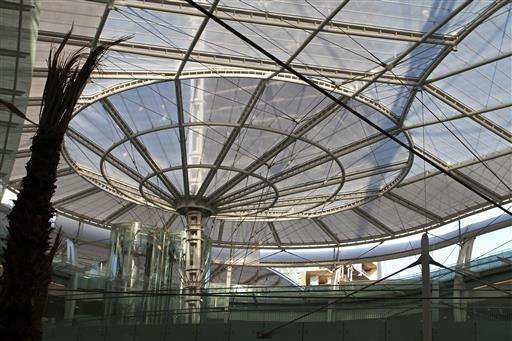 The roof of the mall is a transparent tent measuring 11,000 square meters (118,404 square feet). It is divided into 16 sections supported by steel frames and cables. It is open in some areas, which allows for less electricity use throughout the year and natural ventilation. Shoppers can enjoy coffee and sweets under palm trees while natural sunlight and a cool breeze welcomes them in every corner of the building. The sound of a waterfall cascading from the first to the ground floor echoes throughout the stores and helps naturally cool the air in the mall. "When I'm here, when I look up and walk around, I just feel I'm in an open space," said Ruba Hijazin, while shopping with her family earlier this week. "I'm not shopping in a small box like other malls." The complex also features 12 tunnels for natural heating and cooling, with air circulating from the atmosphere underneath the building foundations and back into public spaces in the mall. An irrigation system waters small bushes and palm trees, helping to conserve water. Hundreds of solar panels circle the perimeter of the roof tent, generating electricity for the building year round. Breakage from 50,000 square meters (538,200 square feet) of tile used in the construction was recycled to insulate the roof and serve as plant mulch. Five additional floors below ground house a parking garage that can accommodate up to 2,400 cars. Chief architect Reem Bdour said she used local materials whenever possible. "A lot of big projects in the city use foreign contractors and use a lot of materials not found locally," she said. "Jordan is a place with very little resources, but we wanted to use material from our environment." 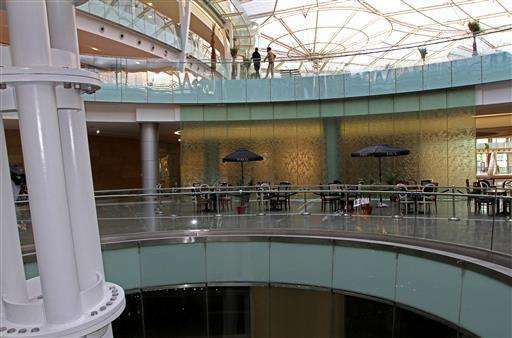 Stone, aluminium and steel come from local companies and Jordanians make up 90 percent of the mall's labor force, including construction, management says. The project received an $80 million long-term loan from the European Bank for Reconstruction and Development (ERBD), which said the mall sets a precedent for environmentally friendly large-scale development. "We see this as the beginning of showing that even commercial sites that have all these other requirements, accessibility, entertainment, hospitality, that they can be environmentally sustainable," said Heike Harmgart, the bank's director in Jordan. 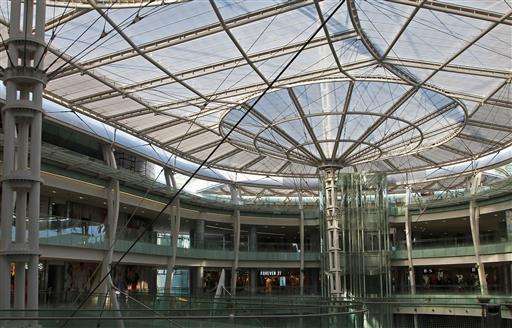 The mall is built to green standards set by the international Leadership in Energy and Environmental Design (LEED). Mall officials said they plan to apply for the LEED certificate after construction is complete. There are four other LEED-certified buildings in Jordan—the Dutch Embassy, the World Health Organization Regional Office Building, the Arab Technical Group headquarters and the Middle East Insurance Company. Jordan must focus more on green building at the grassroots level, said Al-Zubi of EDAMA. "What we want is to change the whole value chain," said Al-Zubi. "You actually want green material companies to open up in Jordan to introduce a new sector which will create jobs for Jordanians." Investment in environmental conservation could generate up to 50,000 new jobs, according to Jordan's Environment Ministry. In September, the World Bank approved a $250 million loan to Jordan to reform its energy and water sectors, but the fallout from the civil war in neighboring Syria, including a growing refugee crisis, has put additional strain on Jordan's resources. Companies in Jordan have become more attuned to saving energy costs, in part because of rising energy prices and cutbacks in government subsidies, said Abdullah Bdeir of the Jordan Green Building Council, a group that promotes green practices. A shift in attitude is needed, especially among owners of small and medium-sized businesses who need to see a return on their green investments. "It doesn't just start with the technology, but with the conviction," he said. The Green Economy can save the Earth. But we have to rid ourselves of the folk steeped in the Old Ways. Many are beyond rehabilitation. Retire them, put them out to pasture, and let the new ideas flourish. Like California in 1980, we hear screams of needing more big baseload powerplants, such as nukes for the future. This is one example why we will not. "EIA only projects a small growth of renewable energy over the next decade"
"That's because there are huge barriers to the deployment of renewables that are rarely discussed..."
"despite the large growth in wind and solar in the last five years, over 67% of renewable electricity is still conventional hydroelectric and biomass, which many environmental groups oppose." "The German solar program is lauded as a great success, ... when looking at the levelized cost to produce electricity, German solar is four times the price of the over-budget Finnish nuclear plant." "If renewables cannot scale fast enough to address climate change, what can? Just nuclear."